The gazebo at the Eagle-Vail West Park is being transformed into a dog memorial by local resident Madeleine Berenson. 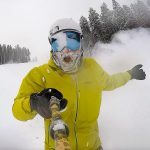 The project was approved by the Eagle-Vail Metro District. The dog memorial in Eagle-Vail’s West Park is starting to come together, thanks to Madeleine Berenson, who turned her mourning from losing Moose, a 12-year-old chocolate Lab, into a positive effort that honors not only Moose, but all Eagle-Vail dogs. 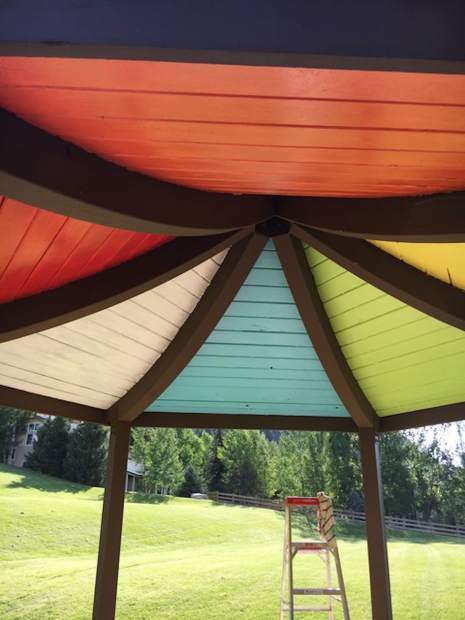 Berenson, an Eagle-Vail resident, has been painting the six-sectioned ceiling of the gazebo with a mural depicting six attributes of dogs that endear them to humans. Plans are to trim the roof with a custom-designed flag and replacing the grill with a dog statue. However, Berenson is still looking for donations to help with the rest of the project. For more information or to find out about volunteering or making donation, contact Berenson at madeleine.berenson@gmail.com or visit the Eagle-Vail West Park Dog Memorial Facebook page. With her own two hands and $250 worth of supplies donated from Home Depot, Berenson has been hard at work to start the summer. “This might not seem like a very big deal, but for someone who’s neither fond of heights or ladders, I am here to say it was quite a big deal indeed,” she said. Berenson has enjoyed meeting fellow residents of Eagle-Vail, and their dogs, during the process. She’s waiting for her granddaughter Violet, 8, to get into town from Portland, Oregon, on her first solo flight to finish the purple section because, well, her name’s Violet. Berenson is grateful to the community for helping back her project, including the folks at Venture Sports, where she gets her mountain bike worked on. Berenson is looking forward to completing the project in July, with a dedication ceremony at some point at the park in Eagle-Vail.